Soon after publishing The Book of Mormon in 1830, Joseph Smith left his home in Palmyra, New York with several dozen followers. 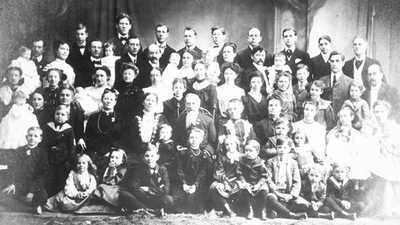 Over the next fifteen years, Smith's Latter-day Saints would travel beyond the boundaries of the United States as they searched for a permanent place to call home. By the time church faithful laid down the foundation for a temple in the valley of the Great Salt Lake, in Mexican territory, Smith was dead and his followers, though now more numerous, had been forced out of communities across the American continent. 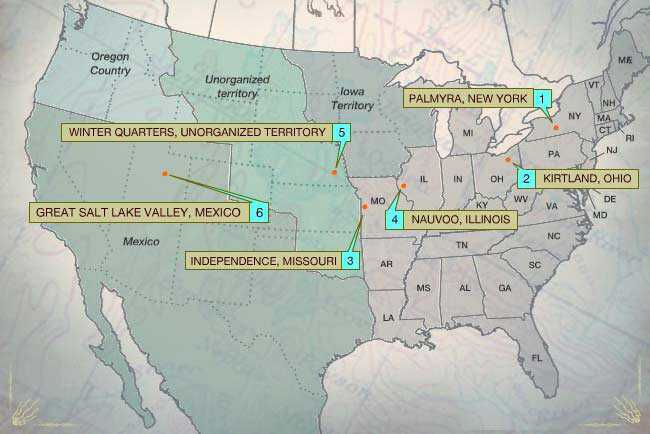 Trace the Mormons' path from New York to Utah Territory using this map. "In the 1820s and 1830s, upstate New York is in fact the American frontier. It is on the edge of civilization." Shortly after the Erie Canal opens in 1825, upstate New York is still a sparsely populated, rugged frontier. The area will later be called the "Burned-Over District" -- burned over by endless religious revivals during this era of spiritual seeking. On March 26, 1830, Joseph Smith publishes the first edition of The Book of Mormon. The book is a translation of golden plates that Smith reports to have dug up in surrounding hills. Smith says he was led to the plates and instructed by an angel, Moroni, in a series of visions. An early review in the Rochester Daily Advertiser declares The Book of Mormon to be "an evidence of fraud, blasphemy, and credulity, shocking both to Christians and moralists." 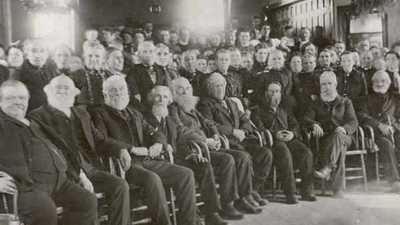 Within weeks, however, Smith's new church has attracted forty members. As Smith's Church of Christ grows, he finds himself under greater scrutiny from local authorities and residents. Sidney Rigdon, an Ohio preacher who learns of Smith's religion through missionaries, embraces Smith as a new prophet and urges the New York group to migrate to Ohio. In January 1831, Smith leads his family and about seventy-five followers west to Kirtland, Ohio. "Kirtland is both the best of times and the worst of times for the Mormons." Americans only begin settling the area in numbers at the end of the 1812 conflict between the U.S. and Britain. After 1830, Kirtland becomes a magnet for Mormon settlers. "They came, men, women, and children, in every conceivable manner," according to one history of the area, "some with horses, oxen and vehicles rough and rude. while others had walked..."
By 1837 the town's population will swell to more than 3,000, with the majority Mormons. The growing community plans a grand temple. The Mormons toil on the large stone building from 1833 until 1836, dedicating one day out of seven to its construction. During the temple's consecration, hundreds report seeing angels and other miraculous visions. Many in the community are poor or have sold their assets to join. Joseph Smith announces a revelation setting up the United Order of Enoch. The economic order, like those of many communistic societies of the era, requires church members to give their property to the church for redistribution. In November 1836, during a national speculative rush, Joseph Smith and Sidney Rigdon establish the Kirtland Safety Society Bank. When a banking crisis sweeps the country the following year, the bank tries to stay afloat by printing more money. Merchants consider the bank notes worthless. A warrant for Smith and Rigdon's arrest for bank fraud is issued on January 12, 1938. Smith and most of his followers -- including a new member named Brigham Young -- leave Kirtland for Independence, Missouri, where Smith has been sending missionaries and building another Mormon community. "The Mormons and the Missourians were essentially oil and water... They did not mix." The Indian Removal Act of 1830 requires all Indians to move west of the Missouri River. Independence, just three miles from the river, is the western edge of American settlement and an early stop on the Santa Fe Trail -- and later the Oregon Trail. Months after settling in Ohio, Joseph Smith declares that Independence Missouri was the site of the Garden of Eden and will become a "New Jerusalem." Missionaries there establish a printing press and publish the westernmost American newspaper, The Evening and Morning Star. Smith's revelations -- many printed in the paper -- stress that Mormons are entitled to their land and should secure it by force if necessary. Non-Mormons fear that the Mormons, who have formed a militia, will take their land. And although Smith's church officially supports slavery, other Missourians also oppose some Mormons' abolitionist sentiments. Following the Missouri Compromise of 1820, slavery is legal in the state, but the dispute over extending slavery to new territories is intense. In the summer of 1833, an angry mob storms the newspaper's offices, destroys the press, and tars and feathers two Mormon leaders. The tensions and skirmishes escalate, forcing the Missouri Mormons to relocate several times over the next few years. In 1838, Joseph Smith and the Ohio Mormons arrive. On October 27, 1838, Missouri governor Lilburn Boggs takes a dramatic stand to end violence. His executive order calls for the expulsion or extermination of all Mormons from the state. 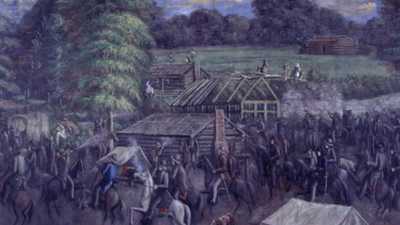 Three days later, a raiding party massacres church members, including children, at Haun's Mill, The Mormon community leaves Missouri for Illinois. "Far from the Promised Land, it's swampland. There's mosquitoes everywhere, malaria outbreaks..."
In the 1803s, land speculators invest in a Mississippi riverbank area they call Commerce. The marshy swamp, plagued by malaria, fails to attract any permanent settlers. When the Mormons arrive in 1839, on a wave of sympathy following the Haun's Mill massacre, only a few lone cabins remain. Smith purchases 15,000 acres and names the settlement Nauvoo. Free from the hostile persecution that dogged them in Missouri, Smith and his followers begin building a communal society. Joseph Smith writes Nauvoo's city charter and is elected mayor. By 1844, the dynamic settlement's population has grown to 12,000, rivaling the size of Chicago. Smith has himself appointed chief justice of the city court and lieutenant general of a Nauvoo militia, merging church and state in a thriving theocracy, where Mormons wield political and military might. Smith receives two key revelations in Nauvoo: the baptism of the dead, and plural marriage, which will be controversial from the start and a flashpoint for anti-Mormonism for decades to come. In early June 1844, the first -- and only -- issue of The Nauvoo Expositor appears. Published by a Mormon opposed to plural marriage, the newspaper exposes Joseph Smith's secret practice of polygamy. An enraged Smith orders the destruction of the newspaper's press, antagonizing the public with his assault on a basic American freedom. Smith is charged with treason and arrested. An angry mob storms the Carthage, Illinois jail where Smith is being held. During the attack, Smith falls from the second floor window and is killed. Illinois authorities revoke Nauvoo's city charter and ask the Mormon community to leave. In February 1845, emerging church head Brigham Young leads thousands of Saints out of Illinois, heading west to Mexican territory. "They're cold, they're hungry, they're exhausted. Their prophet has been martyred. In some sense, they have nothing left to lose..."
The temporary camp known as Winter Quarters is on the western banks of the Missouri River in a region not yet part of any U.S. territory, across from Kanesville, Iowa (later known as Council Bluffs). California and Oregon-bound explorers use Kanesville as a departure point. The journey from Illinois is slow, covering only a few miles on some days. Lacking wagons and horses, some migrants pull hand-carts across the rough terrain. The convoy endures bitter cold at first, then debilitating mud brought on by spring rains. The travelers suffer immensely, and many die. The first convoy to arrive at the place that will become Winter Quarters divides the camp into wards, plants crops and builds log cabins. Young develops into a pragmatic leader, mostly administrating, not prophesizing. The Mormons will continue to use Winter Quarters for years as a stopping point on the route west. After such a treacherous journey, Brigham Young decides it will be best to wait out the coming winter at the settlement. The cold months prove brutal; fifteen percent of the population dies from scurvy. In April 1847, the first group leaves Winter Quarters and heads towards the Rocky Mountains. For once, the decision to depart is the Mormons' own. "It's a Biblical landscape. You pass through mountains, a valley opens before you, and it's a harsh landscape." The desolate terrain of the Great Salt Lake valley had attracted no permanent settlements. Spanish and Mexican explorers had passed through the Mexican territory in forging westward trails. John C. Fremont, a lieutenant with the U.S. Corps of Topographical Engineers, had surveyed the area in several expeditions from 1843 through 1846. Brigham Young bases his decision to relocate the Mormons partly on Fremont's surveys. On July 24, 1847, after 111 days of travel, Brigham Young's advance party reaches a barren desert spot near the Great Salt Lake. Young declares, "It is enough. This is the right place." The first group sets up streets on a grid, defines lots by number and reserves a central area for their temple. At the outset, the Mormons struggle: the first crop yields potatoes the size of grapes, livestock falls to wolves and Indian raids, and the first spring crops are ravaged by insects. A larger second wave of Mormons arrives in the summer of 1848. The Mexican-American War has ended and the settlement is now United States territory. The Mormons want to name the territory Deseret, after a Book of Mormon word meaning "honeybee." The United States names it Utah after the Ute tribe of Native Americans. In 1850, the U.S. appoints Brigham Young governor of the Utah Territory. During the rest of the 19th century, the Mormon migration into Salt Lake continues at the rate of several thousand new arrivals per year. But it will not be until 1896, after years of conflict between the Mormons and the Federal government, that Utah will become the 45th state of the United States. Today, a large majority of the state's residents are Mormons. Follow this chronology that details Mormon beliefs and major events.